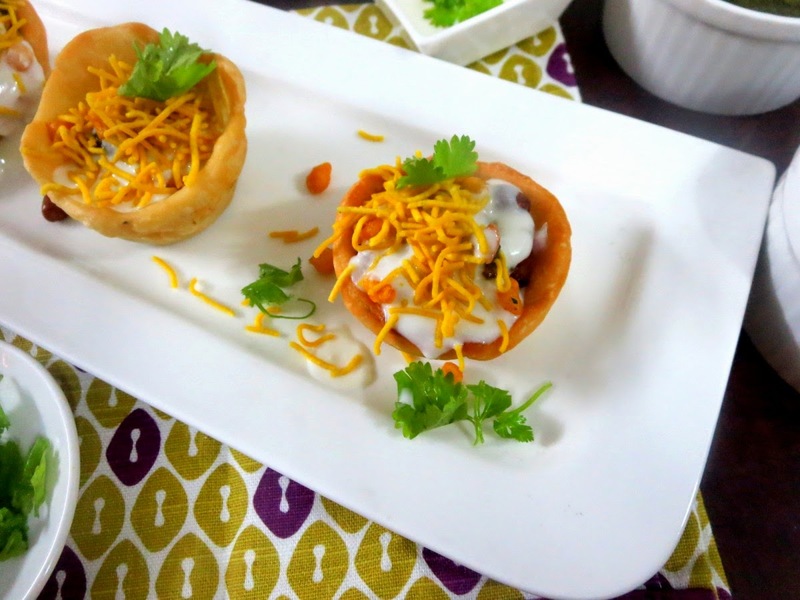 For the second day under BM#48, Chaats, I have my most favorite Chats, the Katori Chat. Chats are those dishes that one can literally adapt to their taste and methods. The first time I tasted these were during a cooking competition that I was judging. The ladies had come out with such interesting dishes and some innovative dishes. The Katori Chat that I tasted that day was so sinful with loads of aloo and chat ingredients added. I have been planning on making this forever! As with all chats, the chutneys are a must. I made a green chutney and a meethi chutney along with boondi and sev for the crunch. 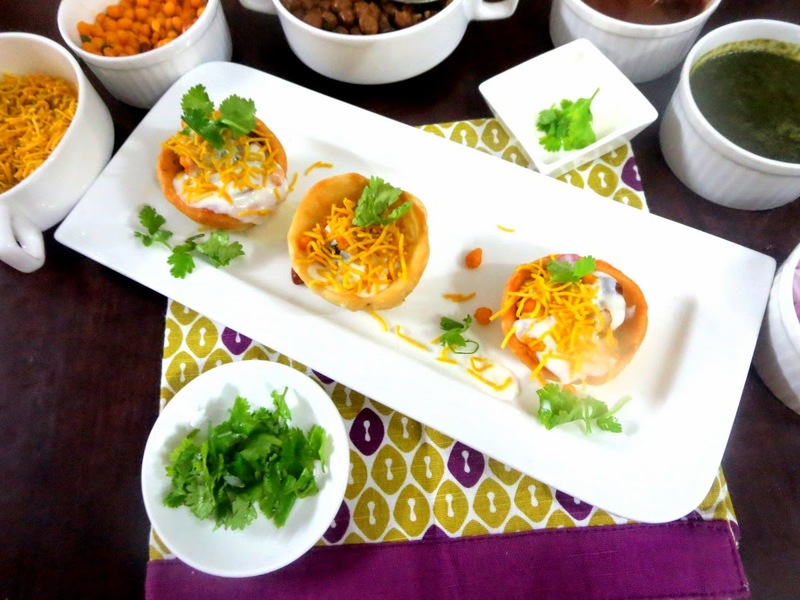 While Konda and Peddu enjoyed as such, Chinnu enjoyed the crispy outer shell with sev and boondi. Well as expected there was much demands for this to be repeated again. The outer shell takes some time to get cooked, while once made it’s such a breeze. 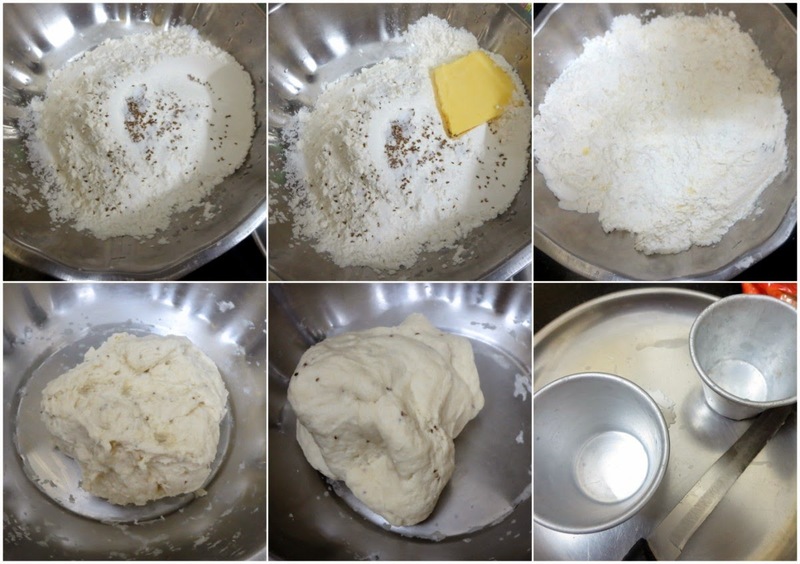 In a wide bowl, take the flour, salt, ajwain and cold butter. Crumble well. 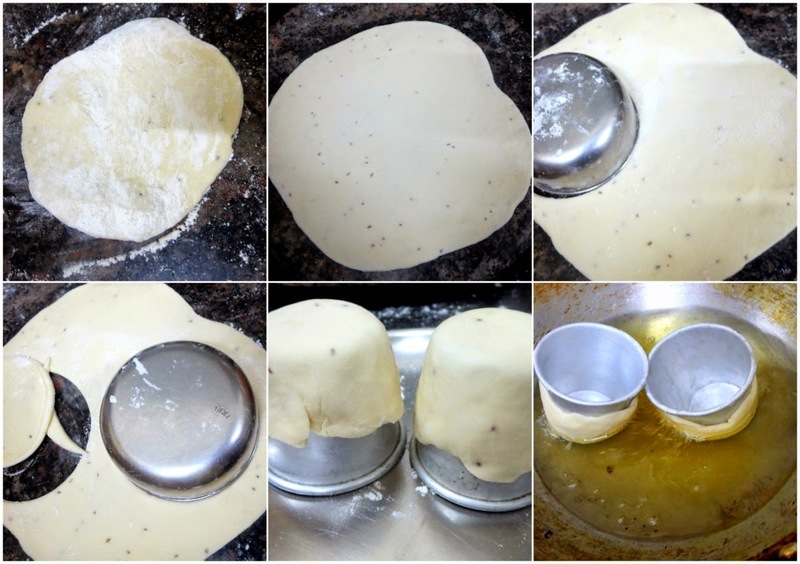 Add water slowly and knead to a stiff dough. Dust well and roll out thin. Using a katori, press out the rounds. Grease the katoris that you want shape on. Press the cut circles on the katoris, Prick with fork all over the katoris, so that it doesn’t puff up. Heat a kadai with oil, gently drop the katoris into the hot oil. Cook on low flame till the katoris turn crispy. 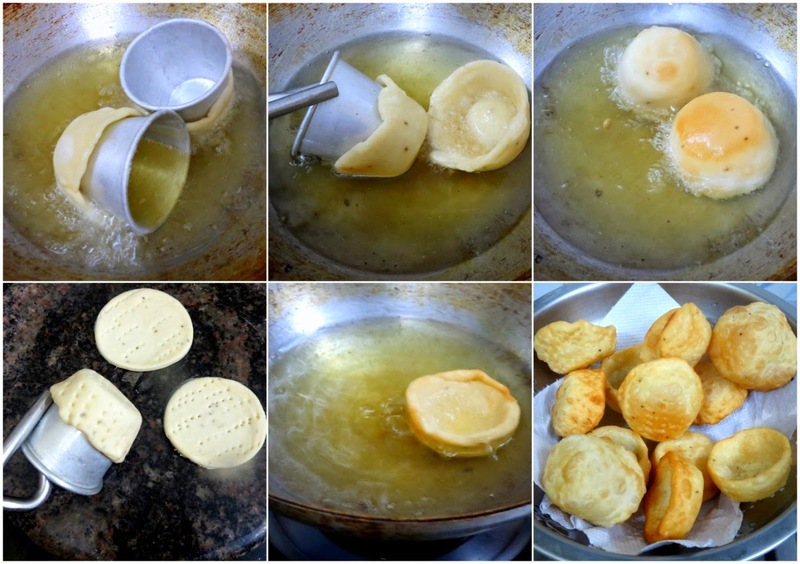 Remove on kitchen towels, Then again fry for a second time, so that the katoris become crispy. Drain and store in an air container. Heat a pan with oil, add the boiled chana, all the spices, cook till all the spices are incorporated to the channa. Grind all the ingredients together, add lemon juice. Very colorful. Chats in any form is tasty. Those shells look great Valli. 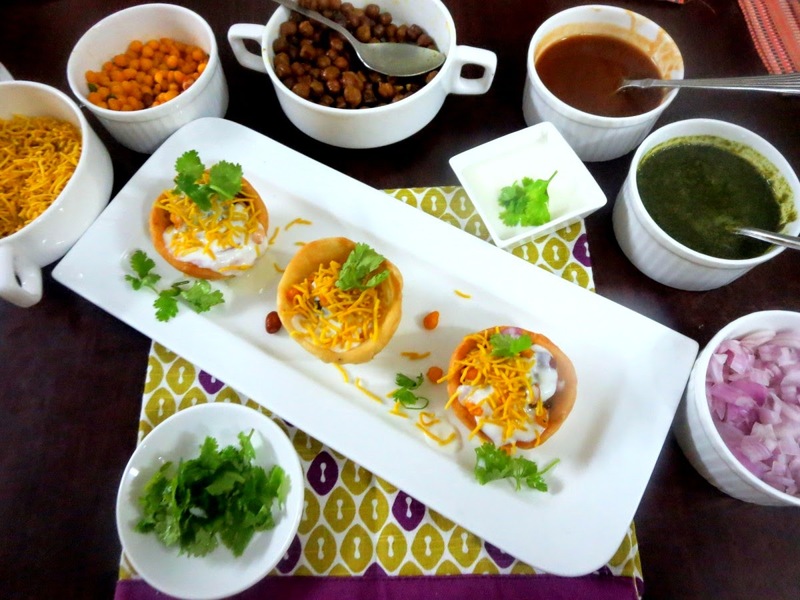 Though it takes time n effort, all worth it for this yummmmmy Chaat. Bookmarked. Pics are lovely too. Oh yum yum yum!! That is one colorful spread! I want to make some now!! Wow! You fried individual katoris? Hats off for your patience!! The results make it worthwhile, I guess!! A tempting and yummy katori chat. Wow valli u rock, those katoris are torturing me, hats off to your tremendous work. 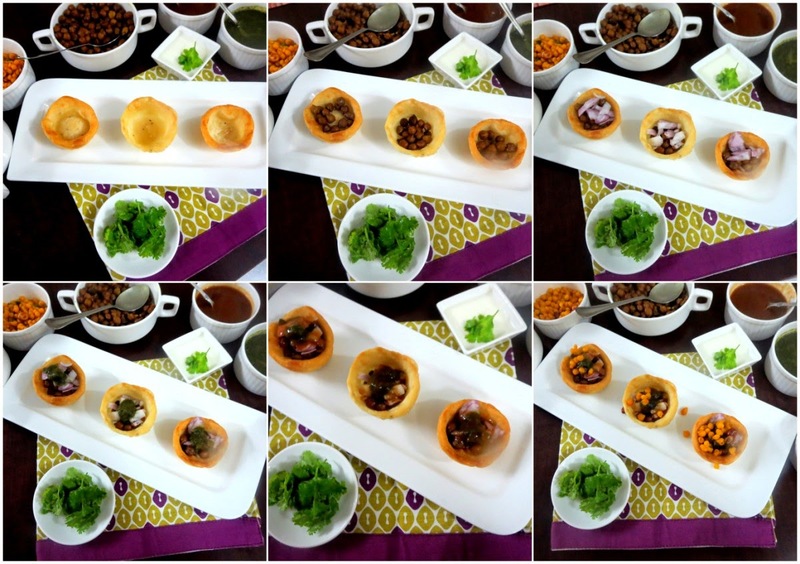 I can't stop admiring your patience in making all the katori from scratch….Beautiful presentation!! 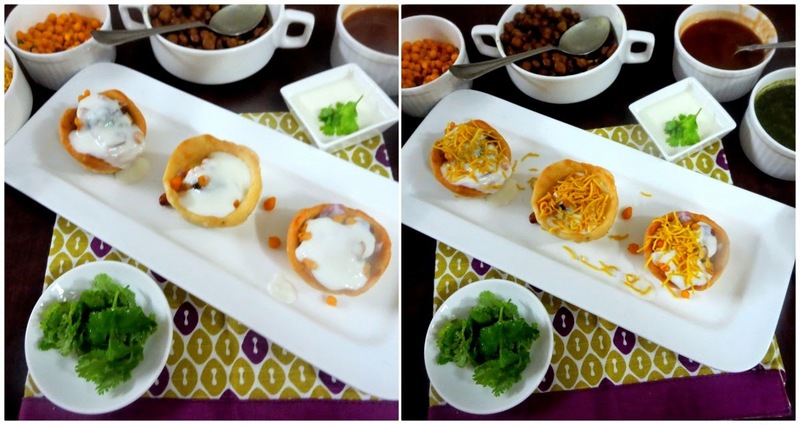 They look awesome indeed..
That is such a crowd pleasing and delicious katori chaat. Can the katoris be made ahead of time and stored? Mmmmm! Valli can I join you alonng with the kids. This is just yum.